Hikers Special! 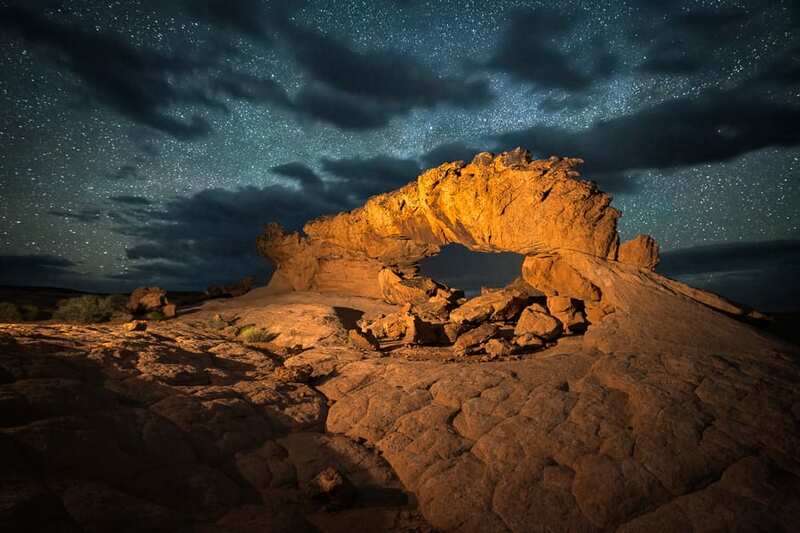 The Northern End of the Grand Staircase Escalante boasts a plethora of world-class photo destinations that will appeal to your adventurous side. 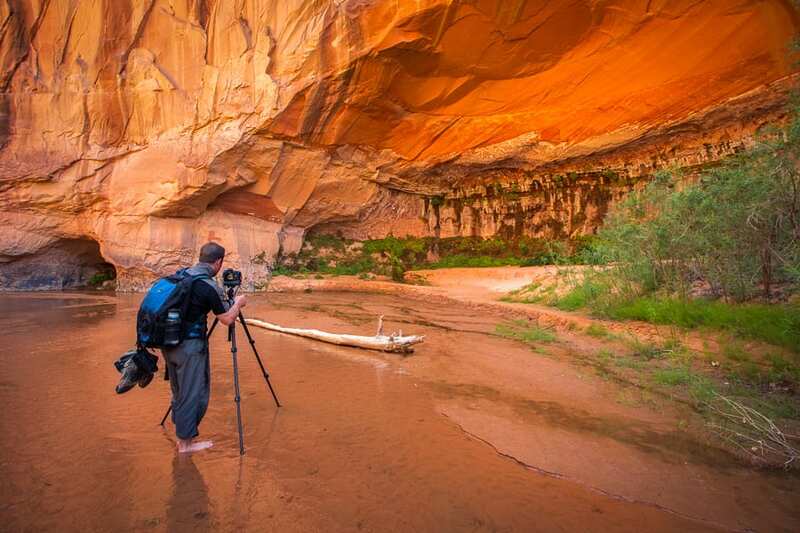 A 2-day minimum is required for Ultimate Escalante trips. 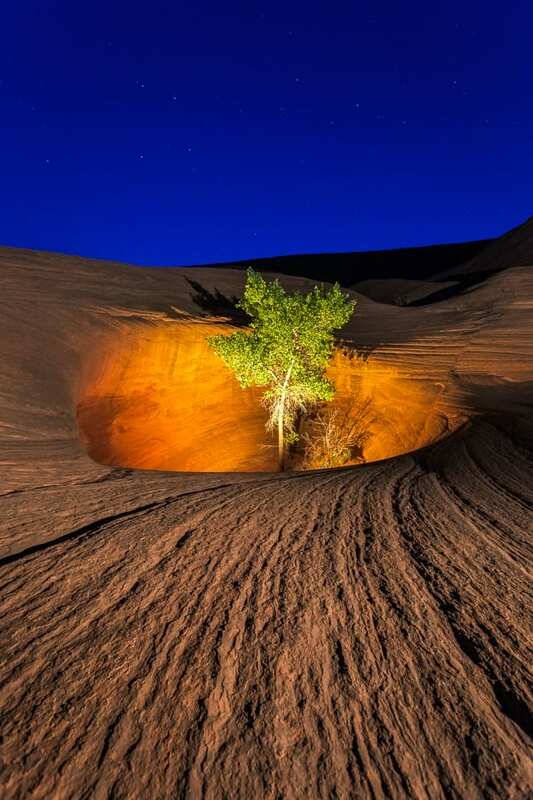 We can meet you in Escalante, UT or arrange transport from Kanab, UT. Click Here if you are only interested in single day options. This tour is fully customizable based on what you want to photograph and how much hiking you want to do. Please tell us your preferences when making your booking. The start time will be adjusted according to where we decide to go. Maximum group size is 5 people to ensure personalized instruction and individualized attention. Transportation provided in 4WD trucks to get us into some remote locations. A 2.5 mile round trip hike over trail-less terrain to access one of the most unique arches in Utah. Great for night photography! Often combined with Dance Hall Rock. Moderately easy 5-7 mile round trip hike to a very narrow slot canyon (not recommended for large people). There may be some water to wade through at the entrance. Is often combined with Tunnel Slot and the Moqui Marbles. 6 mile round trip hike on a nice trail to a dramatic 214-foot waterfall! Seasoned hikers can do both the Upper and Lower Falls. Phenomenal in autumn. Great photography spot with less than half mile hiking. You'll end up with a lot of keepers among the strange hoodoos and arches. It's really nice for night photography! This 8-10 mile round trip hike really delivers. 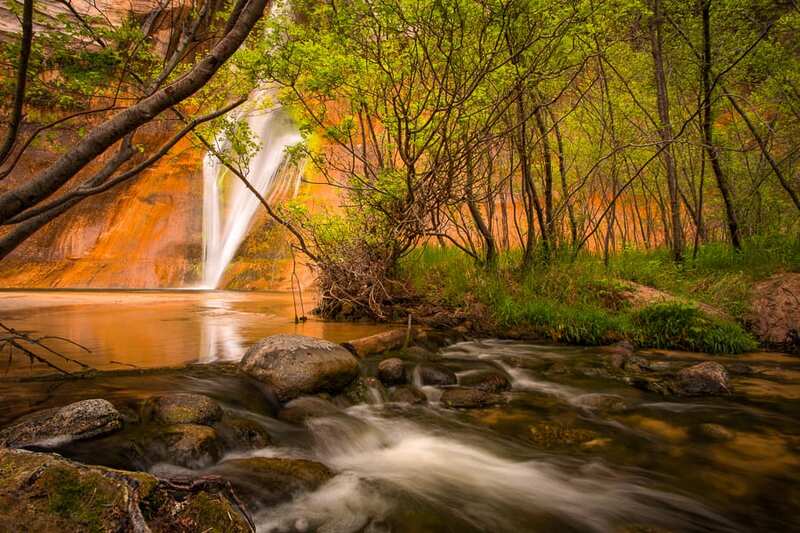 You'll get to photograph waterfalls, huge arches, towering canyon walls, hidden lagoons, and much more. It's popular to do this as an overnight trip. 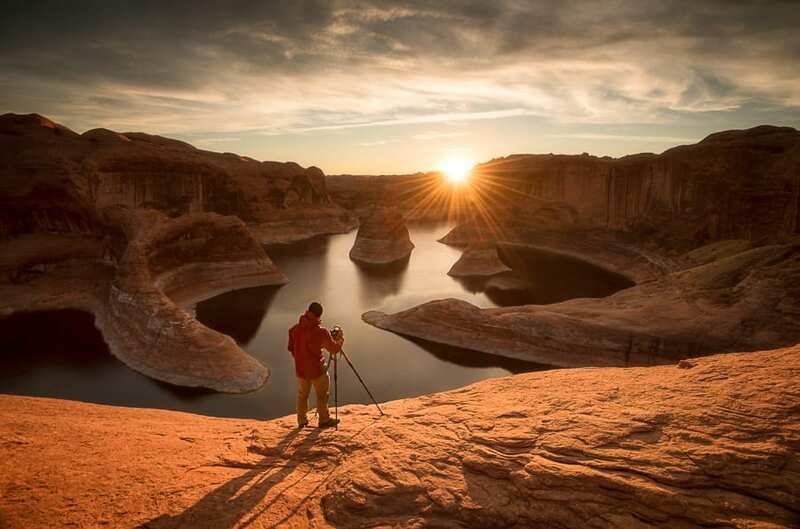 Overnight backpacking trip out to one of the most spectacular viewpoints on Lake Powell! It's 10-miles each way and we spend the night to capture sunset, sunrise, and night photos. 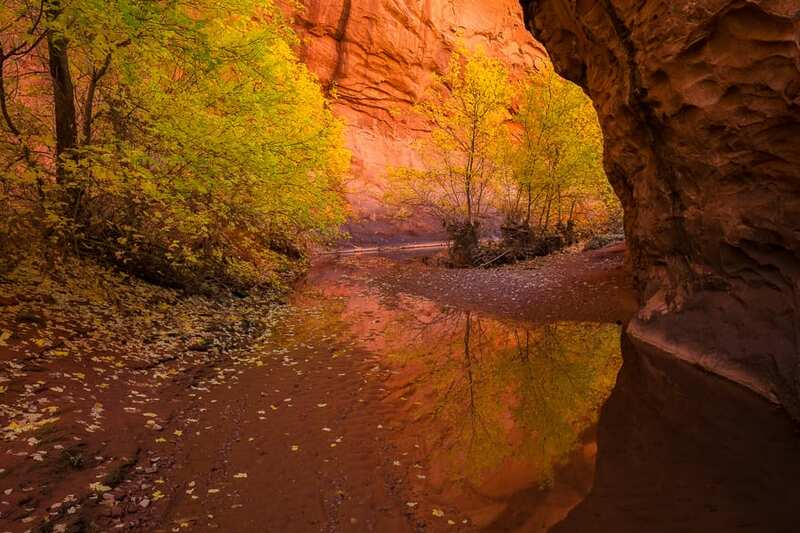 It's a short hike to these absolute gems of a slot canyon. It takes some athleticism to climb over and squeeze through the narrow parts. There are other slots in the area we can take you to as well. There are lots of backcountry canyons we take you to if you're able to hike 10+ miles in a day. 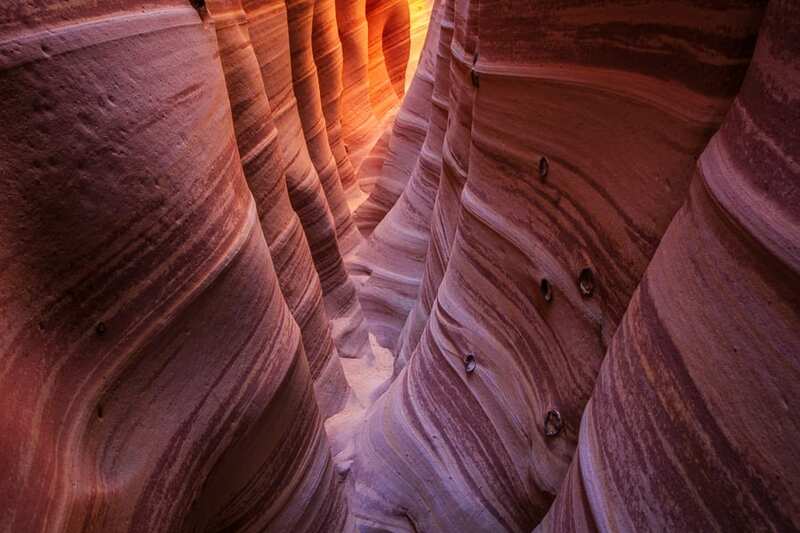 This would also include the Golden Cathedral in Neon Canyon. Tour Length: 2-day Minimum. Expect 8-9 hours each day. Drive Time: Variable – depends where we go. We will be based out of Escalante, UT and many of the locations are accessed via Hole-in-the-Rock road. This road can be very rough. Time Spent on Location: Approx 6-7 hours each day with the rest for drive time. Tour Departure Time: The time given on the booking is just a placeholder until we figure out which location(s) you want to visit. Note that we operate on Utah time which is one hour ahead of Las Vegas. During the months of Daylight Savings (approx mid-March through early Nov), Utah is also one hour ahead of Arizona. Please take this into consideration if traveling from out of state. Tour Pricing: Please click on the Book Now button for the latest pricing. This tour requires a 2-person minimum. Single individuals can always go, but may need to pay the 2-person rate if nobody else decides to join. Due to the various options available on this trip, it may be difficult to find somebody else to join. 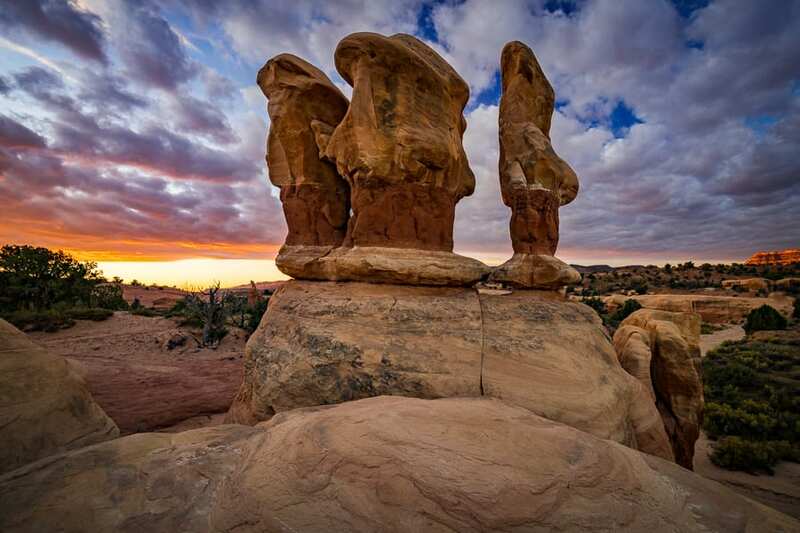 Tour Meetup Location: We meet most clients up in Escalante, UT and pick them up from their hotels. Please let us know where you'll be staying so we can coordinate the pickup. If you want transportation to/from Kanab, please contact us ahead of time and we'll tell you where to meet us. Permits: We hold commercial use permits for Grand Staircase Escalante and Glen Canyon. 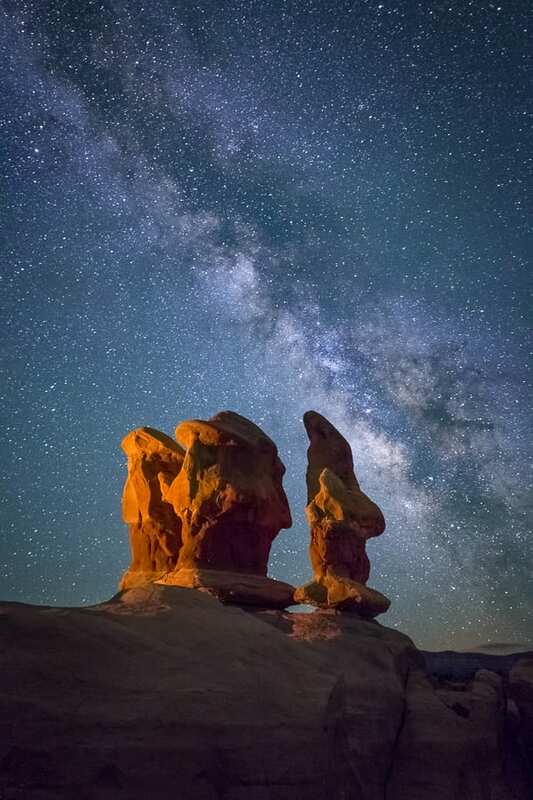 Night Photography: With some of the darkest skies in the lower 48, the Grand Staircase Escalante is one of the best places for night photography. Contact Us if you are interested in arranging a night photo tour. Weather Conditions: If it has been raining or snowing recently, then we may not be able to access certain areas since the roads get too muddy. Should this happen, we will make alternate arrangements or plan to visit different sections of the monument. This decision will be made the day of the outing depending on the consensus of the group. We will still always try to go out even when the weather is poor (cold, windy, rainy, etc). Note that we cannot offer refunds due to weather unless we cannot go out at all. Don’t despise inclement weather as that is when you get the most dramatic photos! Just make sure you dress and prepare adequately. Hiking / Fitness: We will tailor this trip to the fitness levels of the participants. 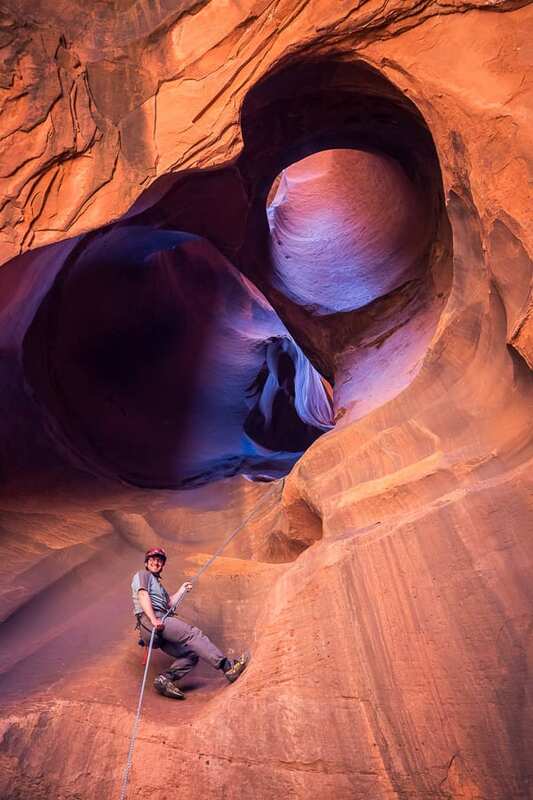 If you want to do the Coyote Gulch, Neon Canyon, and Reflection Canyon options, then expect a minimum 10-miles per day over steep, loose, and uneven terrain. Some rock scrambling may also be required. 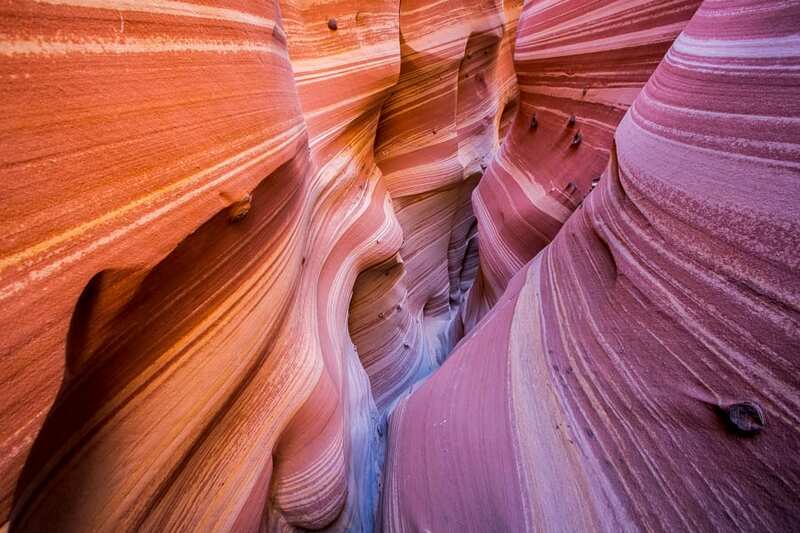 The slot canyons require anywhere from 3-6 miles of hiking over easier terrain. However, you should be able to climb up, under, and over rocks and be prepared for hiking in water. The easier areas in the monument are just a 1-3 mile hike over fairly easy terrain. Trip Itinerary: Please let us know which location(s) you are interested in when making your booking. The exact trip itinerary is kept flexible to account for current conditions and weather. Food / Water: We do not provide food on our outings. All participants should bring their own lunch, snacks, and or dinner. Please bring water for the hikes. Restroom Facilities: There are limited restroom facilities in this area. If you need to use the restroom during the outing, we will have toilet paper and hand sanitizer available. You can dig a hole behind a bush to do your business. What to Wear: You should check the weather forecast prior to coming on the trip (search for Escalante, UT on Weather.com). If it’s going to be hot, wear light-colored clothing and a hat since the hikes may be in the sun. Bring shoes that are either waterproof or ones that you don’t mind getting wet. We don’t recommend sandals since they fill up with grit and rocks. Closed-toed shoes with hiking socks are best. If the weather is cold, wear long pants and bring a jacket. Hat and gloves may be necessary during the coldest months. Don’t forget sunglasses and sunscreen. Cell Phones: Bring your cell phone along! They are great for capturing candid images. Note that you will not have service during many portions of this drive. We will have USB charging ports in the vehicle if you want to bring a charging cable. Group Size: Our groups will never exceed 5 people per guide. We like to keep our photo tours small so we can give adequate individual attention. Guides: Due to scheduling complexities, we often don’t know which guide will accompany your group until a day or two prior. If you want a specific guide, then please Contact Us to make your request. Although we’ll do our best to make it happen, please note that there are no guarantees. Camera Gear: You can make use of all types of lenses on this outing, from very wide angle all the way to telephoto. 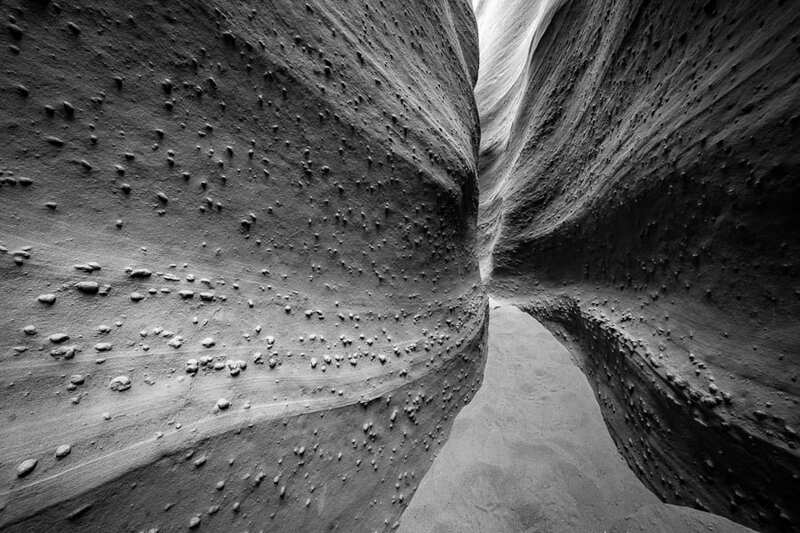 A wide angle zoom lens is useful in the canyons (equivalent 16-35 on a full-frame camera or 10-22mm on a crop sensor). A circular polarizer can help cut glare and enhance clouds in the sky. Telephoto lenses in the range of 70-300mm are very nice for compressing landscape features. Your mid-range lenses from 35-70mm will also be useful in many spots. We recommend that all participants bring a tripod (ensure it’s one you can hike with). 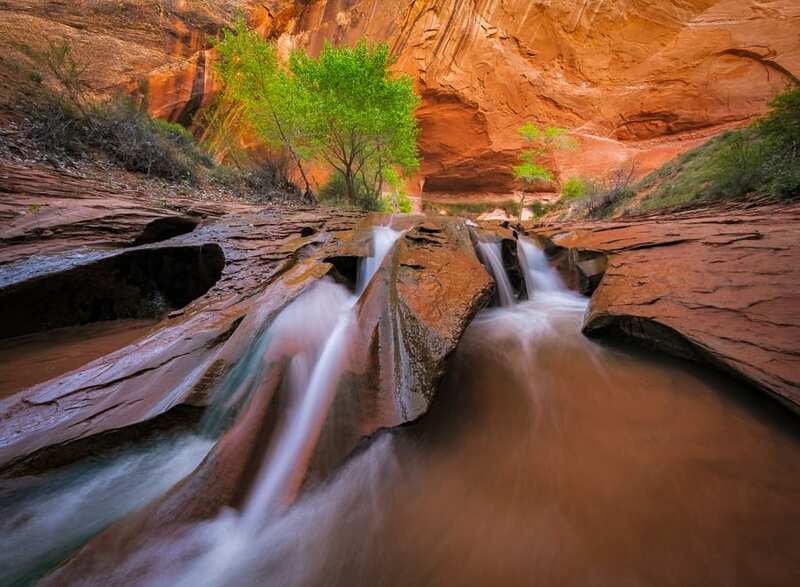 Neutral density filters are also a good idea for hikes like Coyote Gulch to help slow down shutter speeds for soft water effects. Don’t forget extra batteries, memory cards, and cleaning supplies. Please contact us if you’d like to rent any camera gear for your outing. Contact Us if you need specific gear recommendations or would like to rent gear for your outing.